Dr. Maxim Tyorkin always appreciates feedback from his valued patients. To date, we’re thrilled to have collected 15 reviews with an average rating of 4.87 out of 5 stars. 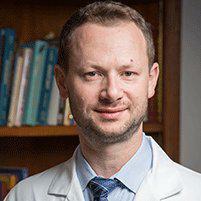 Please read what others are saying about Dr. Maxim Tyorkin below, and as always, we would love to collect your feedback. I have 2 surgeries completed by Dr Tyorkin (different joints!) and I find him to be informative and to the point. Most appreciatively, he doesn't recommend a surgery just for the sake of doing a surgery. Was able to be examined within 15 minutes of my appt. Dr. Tyorkin was thorough and patiently answered my questions. Everything was hand led with efficiency and professionalism. I accomplished my immediate goals with no difficulty. Dr. Tyorkin was very straightforward and clear. My knee issue was not complicated and he explained my issues clearly and referred me for physiotherapy. I would recommend Dr. Tyorkin to friends and family. Great location if you work in Manhattan. No long waits. Dr. Tyorkin is very friendly. Always a positive experience with Dr. Tyorkin and his staff. When you fracture a bone for the first time in your mid-forties, it is never fun! Unfortunately, the first doctor I visited after urgent care was quite insensitive and rather robotic. As soon as I entered the office of Dr. Tyorkin for a follow up visit a month after my accident, I knew instantly I was in for a different experience. The office is very quiet and serene which makes for a pleasant waiting experience even though my wait was less than 10 minutes. Dr. Tyorkin was efficient, straight to the point, while still being attentive and answered all of my questions without making me feel rushed. His office is well equipped to do all necessary x-rays on site. As I walked out of the exam room, the receptionist already had my next scheduled appointment, ready for my approval. I'm grateful to have been referred to Dr. Tyorkin. It was an overall great and refreshing experience. the appointment went on time. pleasant, clean office. efficient appointment. he got to the point. This was my first visit, staff was very professional and the Dr very nice, since it was my first visit I hope the problem with my knee be result in a satisfatory and prompt manner.